This is Mae and her husband, Ben. I convinced them to take a few minutes out of their busy day to pose for me. Ben, along with their six sons, is busy harvesting corn and soy beans. Farm life is busy for Mae and their six daughters, too, with all the household chores, including the daunting task of cooking three meals a day for fourteen people. Like many folks living during the Great Depression, Mae and Ben don’t have a lot of money, but their home is filled with love, and they’re raising kind, hard-working, honest children. That’s just what you do. Doesn’t Ben just look so proud to be standing there beside his bride on this gorgeous autumn day? Any similarity between this post and my grandparents is purely……intentional. 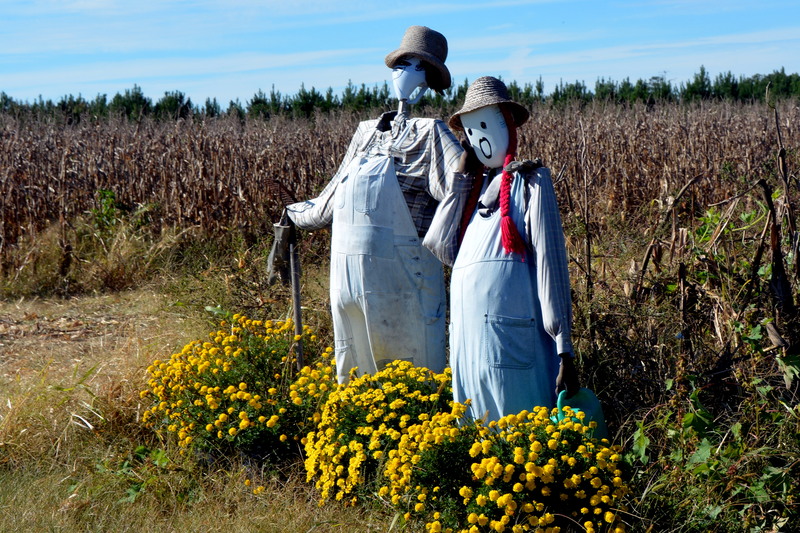 This entry was posted in Family, Traveling Days and tagged farm life, Great Depression, scare crow couple. Bookmark the permalink. 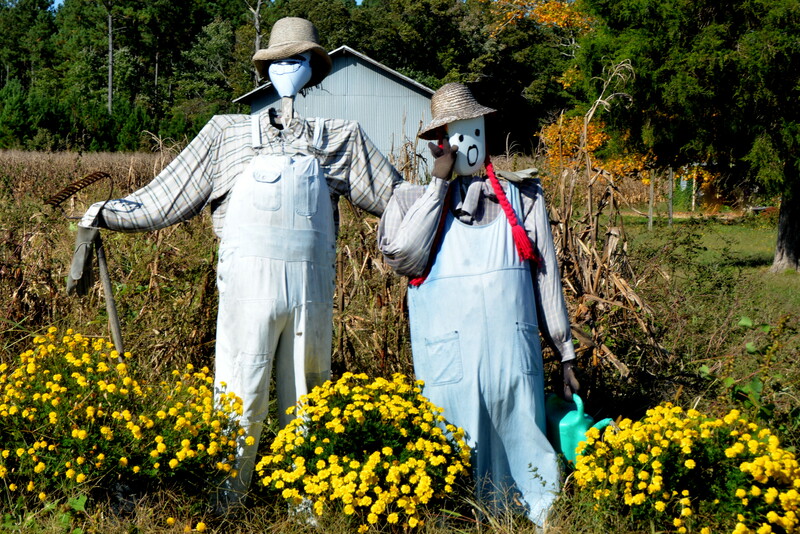 How adorable…..I haven’t seen a scarecrow in ages – much less a “happy couple” ! Love, love, love this post! What an original way to honor our hard-working farming grandparents!! Mae looks amazed about something!!! How cute!!! Love your captions! Perhaps Ben was giving her a little “pinch”. Hey – they did have 12 children! 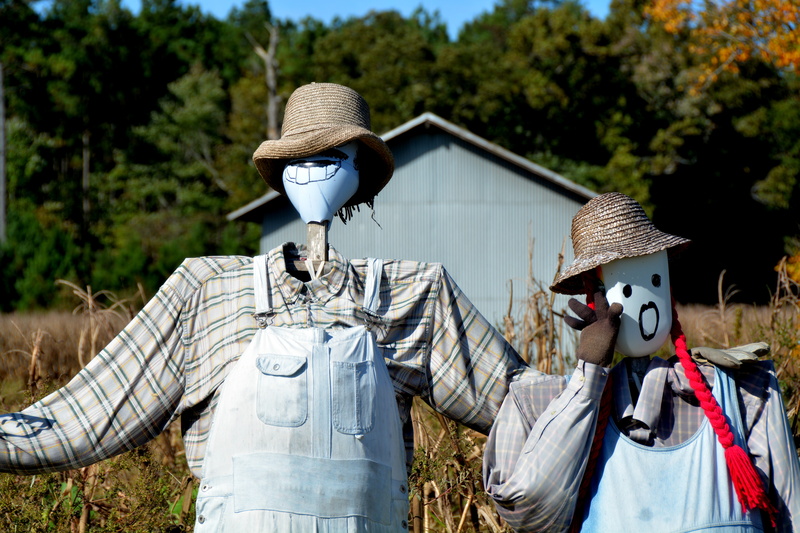 They don’t make scarecrows like they used to. I absolutely LOVE the way your creative mind works. Wonderful, original tribute to your Grandparents. Very sweet, Dianna. Good lives lived well. Awwww what a lovely set of pigtures! Sweet. Clever. Adorable. And a lovely tribute to your grandparents! Very cute. You should make a “couple” to sit on your front porch! a couple outstanding in their field! Just have to tell you that your post is one of the first I go to every day and Mae and Ben are personality plus! 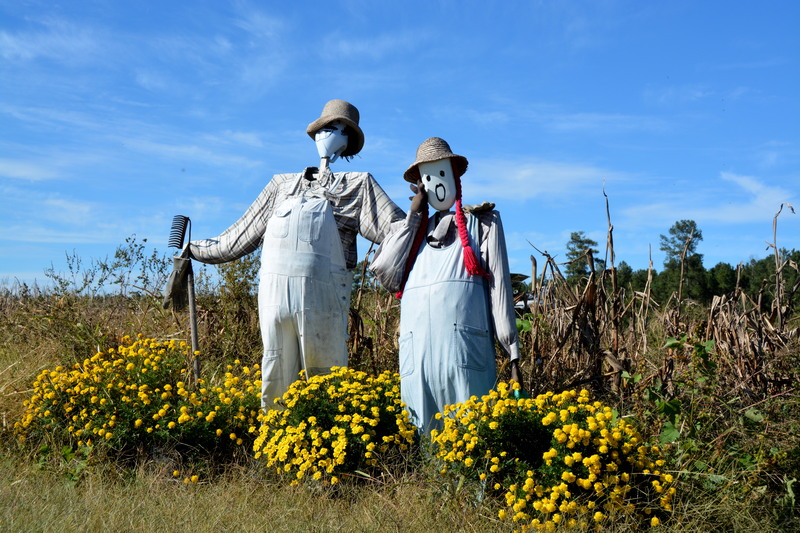 What great scarecrows! Love your little story too! I am with Rita, L O V E I T!!!!!!!!!!!!!!!!!!!!!! !